I'm quite new here and I always follow the development of flown coins, new flown ones and so on. As you know some coins have a kind of certificate (especially the Spaceflight Awarness [SFA] ones), some don't. I, by myself, have a huge collection of flown coins, framed and hung up in my office room. And so, I designed a certificate replica or self-made background for the coins I didn't get the original cerfiticate or no certificate was provided. My latest design was for the Apollo 40th anniversary coin as well as for the SFA Apollo 11 coin. My friends always say that the digital artwork is amazing. Now I want to know the criticism of those, who also collect flown coins. Wow! Your friends are right. These look great. I'd be interested in files of a couple of them, if you'd be willing. Very nice work Chris, I'd be hard pressed to find anything to criticize. I think it's difficult to design certificates that are unique to the artifact and don't fall into a formulaic design solution. You've done a great job with these. Thanks Dave and Joel. It's right, its not easy to design something which doesn't appear to overloaded or formulaic. So it's also everytime a new challenge to me. I just have a coin, probably some background information and that's it. The designs are just the result of an idea. I also though about trading these digital arts or certificate replicas, cause a lot efforts and many hours were spended into this work. I would dispose these, price depends on expenditure but not to expensive. So if anyone has an interest please tell me. I'm gonna upload a few more art works. Some are just simple, others are more outstanding. ...so here we are, some images are taken skewed because the glass of the frame would reflect the flashlight of the camera, so please don't care! ...so that should give you a small imagination. Please feel free to ask for questions or ideas! How BIG is your house/apartment? Beautiful work. ...not as bis as you might think! So concerning lots of demands I decided to sell the certificates in a copyrighted limit. I'm proud to see that obviously some people like my work. It should just be a small remuneration for my work so don't expect a huge price. I also would be interested to design special wishes. Many people just collect coins or medallions and put them into coin boxes and that's it. Every medallion which is made of flown hardware is a piece of history. So for me it's the only satisfaction to frame and to present it in that way. Currently I'm working on a design for the NASA 50th anniversary as well as on the STS-114 Team Award medal. If someone has an idea... please tell me. So as promised here the STS-114 Team Award Design, as a replica of the original Honoree Award. I just covered my name, for privacy reasons, but any name can be added. I commend you on your design work but is it not somewhat concerning to place your name (or any name) on a certificate, replica or otherwise, that was intended as an award for participation in the mission? So and what about medals that were intended as an award for for those who participated in a mission or program? You collect them also, don't you Robert? Also many coins or medals were never released for public, but I don't judge people who collect stuff like that! In my eyes for personal use is such a certificate okay. I wasn't questioning collecting the medals, only presenting them in such a way that they (overtly) imply that they were originally presented to you. Your other replica certificates, as best as I can tell, are generic: they do not name the recipient. I think there is a difference between owning a medal that wasn't originally intended for you and displaying it as if it was, but that is just my opinion. ...but we all own medals that weren't commemorated for us. So it's the same! I do not see a problem: I just design stuff for myself cause I don't want to waste the coins having them boxed and stored somewhere. But obviously some people make a drama of it. Obviously Chris, what you do for yourself is your prerogative however I still think we should strive to represent such pieces accurately, even if only in our homes. These certificates look great Chris, but collecting flown coins that originally were presented to someone else and presenting them as such versus collecting them and placing them on a certificate with your name on it is not the same thing. Unless you show otherwise, did you do anything on the STS-114 mission that would warrant such an honor? It is like those who purchase military medals and try to claim that they earned them in combat. Apollo 7 and 8 in work, as well as the Ares I-X medal... the design can be sold for $10... this time no limited edition. ...so how about this one?! Chris, thank you for quickly sending the MFA certificates you created... they are beautiful! Although I don't have all the medallions yet... I know they will look great when paired with your artwork. Grant you're welcome. Hope you'll have fun with the package! Chris, I really like the certificates you have created. Keep on inspiring. I would like to see Mars directly above the Moon (with out the shift to the left). Otherwise, GREAT! Decided to do something on my free time, here is one of my designs, Apollo 14 Mini-coin. Digital edition and actual result (I think it would look better using a better printer). Apollo 11 and Maiden Voyage flown coins replicas. Very nice. Have any ideas about doing ones for the last launch of each shuttle? (STS-132, STS-133, STS-134) or a big group one? So here is a new concept for Jerry Czubinski's Apollo 7 medallion. The art ist still in progress. I tried to pick up all relevant aspects of the patch and coin. But in my opinion there is to much "black space"... So, any ideas, wishes etc are welcome. Not that it really matters, but should you choose to reflect it in your design, the medallion should be attributed to the Frontiers of Flight Museum in Dallas, Texas. Jerry Czubinski donated the flown material and collectSPACE paid for the minting of the medals in support of the museum and in commemoration of the mission's anniversary. I think that is a beautiful design! 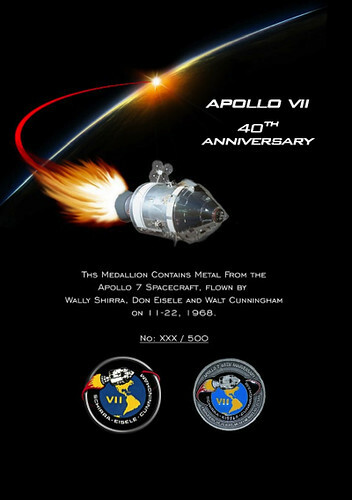 I would suggest working on a version that would incorporate the coin and the new Apollo 7 patch from Walt Cunningham. Those who have both could easily get these signed. A silver Sharpie on all that black sure would look nice! Yes... I did it by myself in Photoshop. Quite easy when you know how to do it. The Apollo Spacecraft has still a grey shape around it, which will be fixed the next day... as I said just a first concept. I like your optimated Apollo VII title, Gary! Which font is that. I'll think I'm gonna keep it... and you officially pimped my design. I know that Jerry donated the flown material and that the coins were minted by FOFM. But without Jerry there wouldn't be any of these coins... So I titled him. But I can imagine to add a light shape of the FOFM logo... anyway the backside of the coin with the minted number should probably also bee displayed. Does anyone has a vector graphic of the coins back? OK, how do I get one of those, it looks great? My only nit is that you're missing the word "October" on the Apollo 7 cert on the last line, as in "October 11-22, 1968". Good catch Hart, you are correct and I overlooked that. And Eisele's first name was Donn, not Don. Col. Cunningham's limited edition patch would go nicely with your presentation. Wally's last name is misspelled too: Schirra (not Shirra).